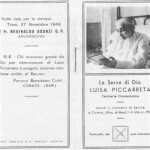 An Introduction Book on the Servant of God Luisa Piccarreta, which includes an introduction written by Fr. Bucci O.F.M., The Three Appeals, St. Annibale Di Francia, important excerpts from the Book of Heaven, and pertinent quotes on Luisa and her writings can be found below. Father Bucci’s Introduction and Biography on Luisa can also be found below separately. * The Typical Edition will be published through the Archdiocese of Trani-Barletta-Bisceglie. A Letter written by Luisa to Federico Abresh can be found below, or at top drop-down bar, Letter No. 65. With her own words, one can well understand the living in the Divine Will. As co-founder with Sr. Assunta Marigliano of the Association of the Divine Will, Fr. 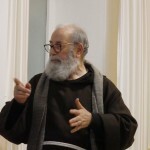 Bucci spent many years as spiritual advisor of the Association which was canonically erected on March 4, 1987 in Corato, Italy, where Luisa lived. 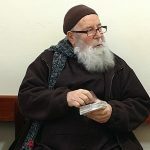 He is currently a member of the Tribunal for the Cause for Beatification of the Servant of God Luisa Piccarreta, which was opened on the Feast of Christ the King in 1994, in the main church of Corato by Archbishop Carmello Cassati, now emeritus, in his role as Promoter of the Faith. 4. All the writings that make reference to the diaries of Piccarreta, must be read and interpreted, only and solely, in the light of Sacred Scripture and of the Magisterium of the Church. The groups must have as spiritual father, priests of sure orthodoxy, and who are legitimately incardinated in their own dioceses or, if religious, in the order they belong to. interpretations. Watching out for these inappropriate interpretations they should certainly avoid attitudes that border on heresy. Our duty is exactly this: a correct interpretation of the writings of Piccarreta in the light of the Magisterium of the Church; this is the precise will of this soul all of God, and very faithful and very obedient daughter of the Church. One who acts otherwise, is certainly a diabolical being who wants to hinder the fulfillment of the Kingdom of the Divine Will, of which the Servant of God is the bearer. 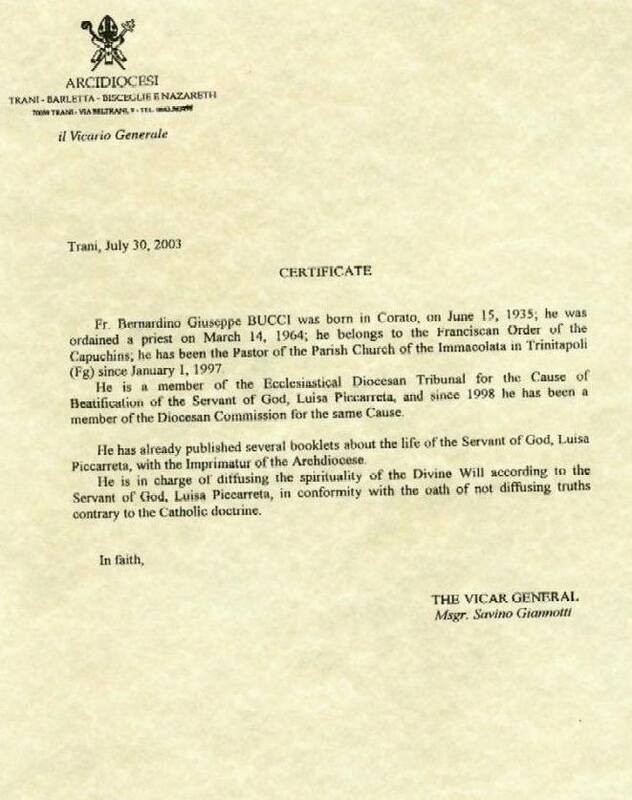 …At this time, responding to these e-mails, I, Father Bernardino Giuseppe Bucci, urge you to not give credit to and to refuse whatever interpretations of the writings of the Servant of God Luisa Piccarreta that are contrary to the Magisterium of the Church, and I invite you to spread this letter of mine to all the groups who, like you, find themselves in difficulty. We consider as a perennial and authentic gift of the Holy Spirit to the Church of Christ, the rising and the spreading, according to the time’s needs, of Movements, Groups and Associations, which identify and appreciate the various charisms poured for the benefit of the community, and which contribute to the perfection of the Christian life, as well as to an authentic and ever growing witnessing in the world, to the most humble and charitable service, and to the most fraternal communion. With highest gratitude to God our Father, We note a special abundance of this gift of the Holy Spirit in Our beloved Church Community in the period after the Vatican Council, which We undoubtedly define as “a Spring for the Church”, observing—as the fruit of a deeply lived experience within the Church according to the dictates of the Second Vatican Council—the blooming of Pious Associations and Movements, of certain Christian-catholic inspiration, through which the faithful live more visibly the mystery of the communion with Christ, participate responsibly in the life of the Church, and perform functions and ministries with awareness and competence, and in the harmony of unity and charity. 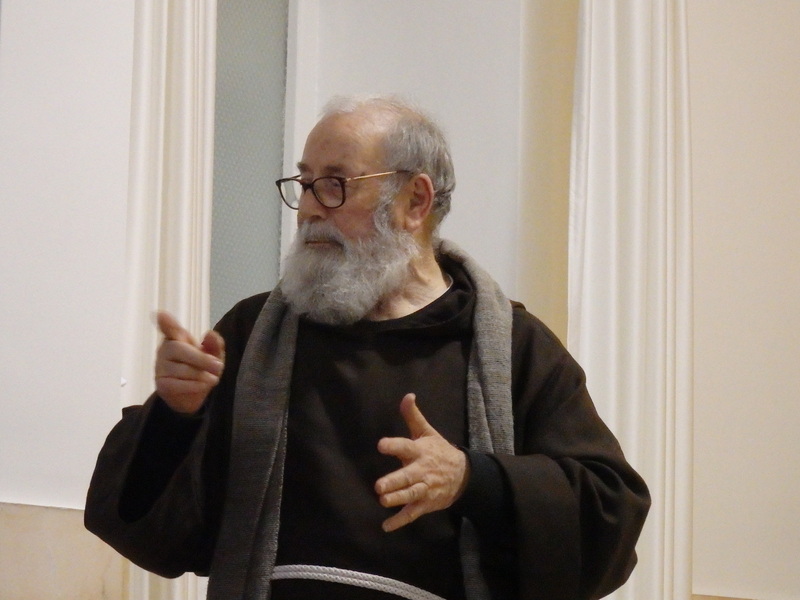 Among these Associations, the one called “LITTLE CHILDREN of the DIVINE WILL” was recently established in Corato. 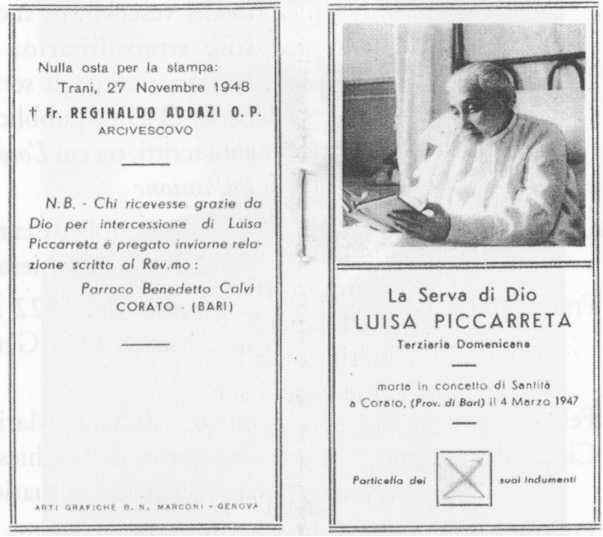 Its main purpose is the Christian education and the ascetic perfection, in the spirit and with the practice of a community prayer of Its members, in the light of the example, the teachings and the writings of the Dominican Tertiary LUISA PICCARRETA, who died in odor of sanctity in Corato, in 1947. The PIOUS ASSOCIATION “Luisa Piccarreta” LITTLE CHILDREN OF THE DIVINE WILL with center in Corato (Archdioceses of Trani-Barletta-Bisceglie) in via Nazario Sauro n.25. The established Association will be ruled by the general norms of CJC (cann. 321-326) and by the above mentioned Statute which We approved. In full uniformity and submission to the Divine Volition, which appears to Us clear in this, through the signs of the times, through the fervor of the supporters and their beneficial fruits in the apostolic field, We encourage and exhort all to continue in their good intentions of sanctity and ministry for the Church, sustained by copious celestial blessings. Given in Trani, from Our Archbishop’s Palace, on the 4th of March of 1987, on the fortieth anniversary of the pious transit of Luisa Piccarreta. I desire to thank you to have welcomed me with affection in my visit to USA. I hope that this meeting has been profitable for all of you and that can continue in your walk for the knowledge of the message that God has left each other through the Servant of God Luisa Piccarreta. Few days before departing, I have met the cardinal William Keeler Archbishop Emeritus in Baltimore. During this important meeting, I have asked to the cardinal to send a letter to Rome to solicit the good course of the cause of beatification of Luisa Piccarreta. The cardinal Keeler has welcomed my application and on October 16 he has sent a letter to the Congregation for the Causes of the Saints in which he recommends the cause of beatification of the Venerable Luisa Piccarreta. The cardinal has also sent me a copy of this letter. We hope that this letter of the cardinal gives good results so that the dear Luisa both as soon as possible proclaimed Saint. I will remember your families and you in my prayers. God blesses you and makes you grow in the Divine Will. VATICAN CITY, 1 FEB 2012 (VIS) – This morning in the Paul VI Hall the Holy Father received thousands of pilgrims from around the world in his weekly general audience. As part of a series of catecheses dedicated to the prayers pronounced by Christ, he focused his remarks on Jesus’ prayer in the Garden of Gethsemane…Benedict XVI invited the faithful to pray to God, placing before Him “our fatigue, the suffering of certain situations and of certain days, our daily struggle to follow Him and to be Christians, and the burden of evil we see within and around us, that He may give us hope, make us aware of His closeness and give us a little light on life’s journey”. Returning then to Jesus’ prayer, the Pope focused on “three revealing passages” in Christ’s words: “Abba, Father, for you all things are possible; remove this cup from me; yet, not what I want but what you want”. Firstly, Benedict XVI said, the Aramaic word “Abba” is used by children to address their fathers, “therefore it express Jesus relationship with God the Father, a relationship of tenderness, affection and trust”. Secondly, Jesus’ words contain an acknowledgment of the Father’s omnipotence “introducing a request in which, once again, we see the drama of Jesus’ human will in the face of death and evil. … Yet the third expression … is the decisive one, in which the human will adheres fully to the divine will. … Jesus tells us that only by conforming their will to the divine will can human beings achieve their true stature and become ‘divine’. ... This is what Jesus does in Gethsemane. 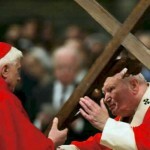 By transferring human will to the divine will the true man is born and we are redeemed”. When we pray the Our Father “we ask the Lord that ‘your will be done, on earth as it is in heaven’. In other words, we recognise that God has a will for us and with us, that God has a will for our lives and, each day, this must increasingly become the reference point for our desires and our existence. We also recognise that … ‘earth’ becomes ‘heaven’ – the place where love, goodness, truth and divine beauty are present – only if the will of God is done”.